In a room with culturally decorated blankets, artwork, and poetry surrounded by an American and Texas flag, students of UNT gathered, ready to listen to the issue of racist mascots that they may not have known existed. 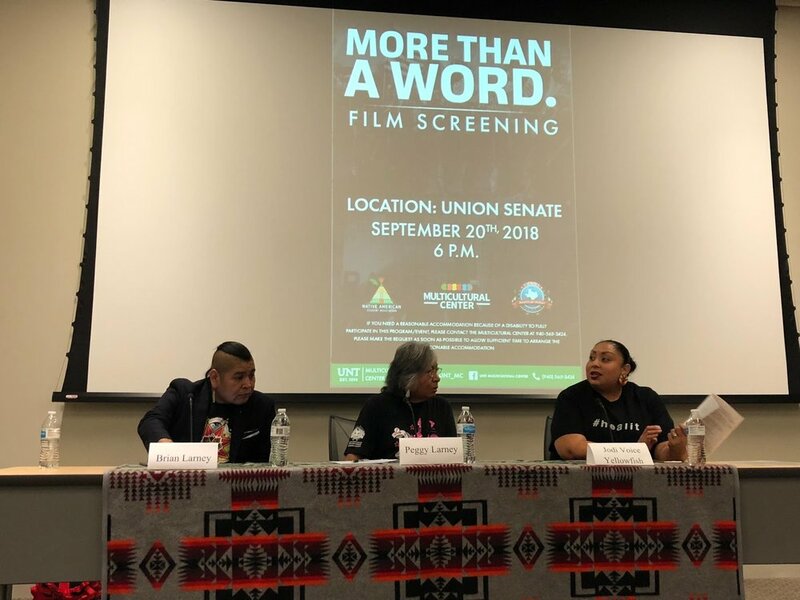 The Native American Student Association held their first ever event on Thursday September 20th, hosting a screening of the documentary “More Than a Word” along with a panel of American Indian tribe members from around the Dallas area. The use of American Indian mascots has been around dating back to 1932 when the Washington Redskins were established. It’s an issue that the documentary describes as feeding into the stereotype that Native Americans are an extinct people. The University of North Texas has an organization ready to bring awareness anyway they can. “This is NASA’s first opportunity to bring a huge issue to the forefront of our community and campus.” The Native American Student Association said after being asked what this event meant to them. One of the main issues with the use of the mascots is the lack of public knowledge that it is in fact an issue. “I had never given much thought into the word ‘Redskins’ being a problem, but if I was Native American I wouldn’t want it used.” Karrie Johnson, a 21-year-old senior at the University of North Texas said. The documentary “More than a Word” focuses on the University of North Dakota and the battle the school had with the NCAA in 2006. After a nearly five year battle the North Dakota state senate ordered the university to change the mascot entirely. A question that typically arises with the removal of derogatory mascots is why now? Why bring up such a trivial issue when many more face the American Indian population? “Institutional racism is not a trivial problem, you have to teach others to unlearn their stereotypes, especially if they are unaware of them.” Peggy responded. The final question asked to Peggy proved to be one she has answered before, how do we resolve this issue of systematically racist mascots? The Native American Student Association is holding three more events in the current semester and plans to continue to raise awareness for their cause. Brain on Fire: A Book to Movie Comparison Which One is Better?